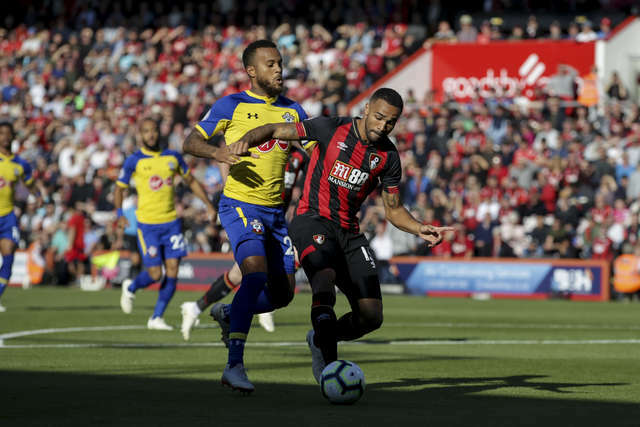 There were no goals between AFC Bournemouth and Southampton as a well-fought but bitty game struggled to get going and ended in a 0-0 draw at Vitality. A poor first half had its best chance within two minutes when Adam Smith couldn't find a clean connection from close in, the game soon descending away from the Cherries' qualities. The pace improved after the interval, Joshua King and Nathan Ake with the two best chances of the game from a home standpoint, but a winner failed to materialise as the frustrated hosts were made to settle for a point, one that seemed stronger following Manolo Gabbiadini's last-gasp howler. A fortnight on from their last game but Bournemouth were unchanged against their south-coast rivals, Ryan Fraser and King declared fit to start despite concerns over the international break. The Cherries caused Southampton headaches in the opening seconds, Smith surging forwards from left-back through the centre, but after laying the ball off Smith could only scuff his shot from the return, just seven yards out. Callum Wilson shrugged off Ryan Bertrand on the right touchline, lay the ball off for David Brooks, but the Wales international skewed off target as he aimed for his third straight scoring match. After the initial burst the match slowed as the teams battled for the higher ground in midfield, the opening half hour higher on physicality than quality, a situation to suit the visitors. A fine ball from Pierre-Emile Hojbjerg set Charlie Austin free on goal, but with Asmir Begovic quickly shuttling out to meet him the Saints man's heavy touch around the 'keeper took the ball out of play. Hojbjerg struck a 22-yard volley down Begovic's through as the first 45 minutes winnowed to its close - the match which had promised so much having failed to live up to its billing at the interval. No changes at the break, King headed Jefferson Lerma's header a yard wide inside a minute of the restart, though the fluidity of the Cherries' performance at Vicarage Road was yet to emerge. Junior Stanislas replaced Brooks in the home side's first change, Eddie Howe shuffling his attacking pack. Stationed down the left the winger's ball through to Wilson saw the ball pulled back to King who, with the game's best chance up to that point, mishit wide from close range. The momentum was starting to build for Bournemouth, a rapid move ending with Simon Francis' cross-shot diverted behind, though Begovic was soon in action to tip over another Hojbjerg dipping volley. Lerma was catching the eye again with his midfield dominance, Ake only able to to find the 'keeper's gloves after connecting with a free header from a corner. Substitute Shane Long wriggled into a shooting position, albeit from a tight angle, but Begovic saved well and held on to eliminate the danger, an opener still yet to be found with under ten minutes remaining. There were more Cherries defensive worries when a cross was headed back to Stuart Armstrong, but when the Scot dithered Francis was able to hack away from a couple of yards out. Lerma's flicked header was saved by Alex McCarthy as the time ebbed away, while substitute Gabbiadini missed possibly the best chance of the entire 90 minutes deep into stoppage time as a cross left him with an open goal, they Italian only able to find the top of the net and not the back if it. The opening period never really got going at Vitality, Southampton quelling the quick home start and reducing the play away from passing and into bullish tackles. The pace was immediately picked up by the hosts following the second-half resumption and King and Ake had chance as they will look back on with disappointment. The game finished goal-less, though the hosts remain unbeaten at home and still 11 points above their afternoon opponents. Becoming a cult hero as a club's record signing is a tough trick to pull off, but the home fans on Saturday were certainly taking the Colombia to their hearts. Partnered with Lewis Cook, Lerma put in another all-action display, breaking up play, nicking in to win balls, disrupting the opposition but as noticeably playing quick passes both short and medium in range and providing an attacking pivot on the edge of the box when the Cherries got into attacking areas.